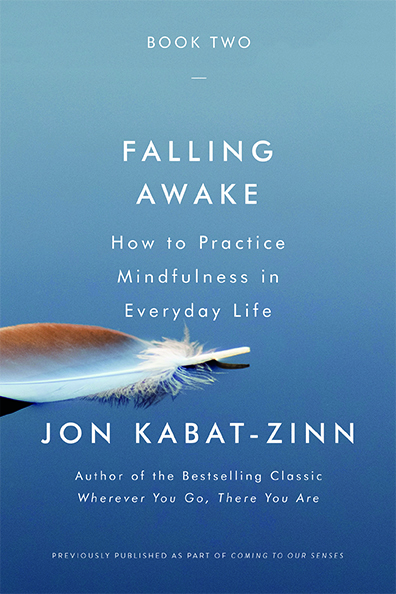 The following is an excerpt from book two Falling Awake: How to Practice Mindfulness in Everyday Life, by Jon Kabat-Zinn, published by Hachette Books. Copyright © 2018 by Jon Kabat-Zinn. “The most important thing to keep in mind when practicing meditation lying down is that, as with every aspect of the cultivation and embodiment of mindfulness, it is about falling awake. But because whenever we lie down there is always the “occupational hazard” of falling asleep, we actually have to work at remembering to fall awake in the face of a not-insignificant possibility that we might drift into drowsiness and unawareness and fall asleep. With ongoing practice, however, it is actually possible to train yourself and thereby learn to fall awake, both in the conventional sense of not falling asleep or getting sleepy, and also in the deeper sense of being utterly present in awareness. There are many virtues to meditating lying down. For one, in the early stages of meditation practice, it may be more comfortable if you are lying down rather than sitting, and you can probably be still for longer periods of time. Then, because we lie down when we sleep, it gives us several built-in occasions every day for touching base with ourselves, one before we fall asleep at the end of the day, and one in the morning as we are waking up. These are perfect occasions to introduce a stretch of formal meditation practice into your day, whether for just a few minutes or for longer, especially when waking up in the morning. Also, when the body is stretched out, particularly lying on your back, it is in general fairly easy to feel your belly moving with the breath, rising and expanding on the in-breaths and falling and deflating on the out-breaths. This position also gives us a sense of being held up, buoyed, supported by whatever surface we are lying on. We can surrender completely to the embrace of gravity, and let go into the floor or mat or bed and let it do the work of holding us up. Sometimes in this position, it can feel like you are floating, and that experience can be very pleasant and increase your motivation for taking up residency in your body and in the present moment. What’s more, the surrender of the body to gravity can entrain the mind into the spirit of what we might call unconditional surrender, not to some external threat to our well-being, but to a full inhabiting of the present moment, independent of any conditions we may find ourselves in. In practicing dropping into the embrace of gravity itself, we are more motivated and more willing to drop unconditionally into now, to bring a radical and openhearted acceptance to whatever we find is going on in our minds or bodies and in our lives in any moment or on any given day, in a word, to let be and let go. When formally cultivating mindfulness while lying down, whether we are in bed or on the floor, it can be especially valuable to intentionally adopt what is known in yoga as the corpse pose, lying on our backs with our arms alongside the body and the feet falling away from each other. There is nothing particularly maudlin about thinking of it as the corpse pose. It is simply a reminder that we can intentionally die to the past and die to the future, and thus give ourselves over to the present moment and to the life expressing itself in us now. Because you are indeed kind of corpse-like in the lying down meditations way you are lying, it is easy in this posture to intentionally evoke an attitude of dying inwardly to the ordinary preoccupations of the mind and the world for a time at least, and opening to the richness of this moment. But that said, of course you can practice mindful- ness in any lying down posture that you care to, such as curled up lying on your side, or lying on your belly. Every posture has its own unique energies and challenges, and every posture is a perfect posture for meeting the present moment with embodied wakefulness and openheartedness. And of course, whatever posture you choose to adopt, there are many different ways to practice, and many different practices to bring to bear on the present moment. So, lying on a comfortable padded surface, either on a rug or pad on the floor, or in bed or on a couch, we might at first give our- selves over to the experience of being here like this, in this posture, whatever it is. In part, this might entail opening to the soundscape and letting it speak, hearing whatever is here to be heard, as if we had died and were now merely overhearing the world going on, only now without us. With this attitude and orientation, we may hear sounds and sense the spaces between them in an entirely new way. Alternatively, you may notice at first that you haven’t been hearing any sounds at all, so absorbed have you been in the roar of sensations fluxing in the body or in what you might call mental noise, the thoughts racing incessantly through your head. The entire meditation could be dedicated simply to being with hearing, bringing our attention back to hearing over and over again when it wanders off, and perhaps inquiring in a non-discursive way as to “Who is hearing?” This is an extremely powerful way to practice . . . the coming to our senses through the sense of hearing. Or, we might allow hearing to be one aspect of our lived experience, which of course it is, and practice with an open, more undirected spaciousness of attention that drinks in sensations and perceptions emanating from all the senses at once, inwardly and outwardly, as they arise moment by moment. And since we are looking at the mind as a sixth sense organ of sorts, the field of awareness would naturally include any and all mental phenomena as well. This practice of undirected spaciousness of atten- tion, which we shall explore in more detail later, is called choiceless awareness. Alternatively we might practice just attending solely to the sensations of breathing, or being with sensations in specific regions of the body, or with an all-embracing sense of the body as a whole. As part of this last practice, we might either include or choose to feature the skin, feeling the entirety of the envelope of the body, tuning to whatever sensations are present as we lie here, and aware of how they are changing. We might also tune to a sense of the air around the body, bathing the body, enveloping the body, breathing the body, and perhaps even imagining the skin itself breathing. We can also just dwell in the watching of our thoughts and the emotional “charges” that they carry, whether positive, negative, or neutral, whether relatively strong or relatively weak, featuring them center stage in the field of awareness while we let all the other aspects of the present moment recede into the wings. Alter- natively, we can place one object of attention in the foreground for a period of time, then allow it to recede into the background as we bring forth some other aspect of the field of awareness and feature it center stage in the field of awareness. As you can see, the mindfulness palette is a big one, whatever our posture. It is continually inviting us to make use of various methods and scaffolding and honor how necessary and important they are in the cultivation and deepening of awareness, equanimity, and non-attachment. At the same time, as we have seen, we can keep in mind and continually “re-mind” ourselves that we can rest in awareness with any object of attention, the breath, various aspects of the body, with sensations and perceptions, with the myriad thoughts and feelings that flux through our minds, or in a vast, boundless, choice-less, open awareness beyond all doing, and just be the knowing that is awareness itself. In making such choices, we can also choose to keep our eyes open or closed. If we keep them open in the corpse posture, we simply drink in through the eyes whatever is above us, usually a ceiling of some kind. Of course, if you are lying in a meadow on a warm clear day, gazing up at clouds for hours at a time is a meditation in its own right, as is gazing up into a tree you might be lying beneath. And of course, keeping the eyes open can be especially helpful and effective in moments of drowsiness and fatigue. But it is also quite wonderful to practice lying down meditation with the eyes closed. Many people find it helpful in refining the awareness of the internal landscape of the body and the mind to keep the eyes closed. They find that it enhances the inward focus and concentration. That is something that you can decide for yourself, and something to experiment with from time to time intentionally. There is no one right way to practice. Some traditions practice with eyes open, others with eyes closed. Sometimes our choice will be dictated by the circumstances of the moment and how we are feeling. But it is best in the early years of meditation to practice primarily one way or the other so that we can come to know the depths of the choice we have made, and not simply flit back and forth from one to the other depending on our mood. As we have noted, it is very valuable to practice lying down meditation before falling asleep and again right away upon waking up. Sandwiching the day in this way, you get to prime and refine your commitment to mindfulness first thing in the morning before even getting out of bed. This can have a profoundly positive and beneficial effect on the entirety of your day, turning the whole of it into one opportunity to practice after another, literally moment by moment. You might even formulate the intention, before getting out of bed, that the entire day will be one seamless meditation on being present in, with, and to your life, as it is and as it is unfolding, bringing to each moment an openhearted curiosity and clarity. That awareness might then extend itself to the very process of the body getting itself out of bed, of brushing your teeth, of taking a shower,* and on through whatever you are engaging in that day. Then, lying in bed at the end of the day, you might experience the body and the mind and how they are in the aftermath of all that has transpired, resting in a felt sense of the body as a whole, and an open spaciousness of mind, beyond judging what was “good” and what was “bad” about the day. Lying here, we can tune in to a sense lying down meditations of the body as a whole, and into our wholeness of being and feel how we are nested in larger and larger spheres of wholeness and relationally extending outward far beyond ourselves. In this way, we can gradually let go of all that has come before and welcome sleep as it comes over us. There are times when I feel a great urge to get on the floor or on the bed and meditate lying down rather than sitting or in some other posture. Just getting down on the floor for a while, or on the earth for that matter, can change your whole orientation toward the moment and the day and what is transpiring. It can slow down or stop the forward momentum of the head and all its drivenness and help you to recalibrate and be more embodied in whatever you are dealing with. It can also enlarge your view of your own mind and body in that moment and how they are responding to what is going on. And, of course, lying down meditation can be profoundly valu- able when you are sick in bed for any reason, or in the hospital, or undergoing difficult diagnostic procedures that can take a long time, such as CAT scans and MRIs, which require you to lie down and be very still. We can turn almost any situation in which we are lying down into an opportunity to practice, and in doing so, discover hidden dimensions of our own life and new possibilities for learning and growing and healing and for transformation, nested right inside the present moment, possibilities and insights that are much more likely to emerge when we are willing to show up and be with what- ever is arising. Liked this excerpt? Buy the full book, Falling Awake today. Jon Kabat-Zinn articles and videos on WisdomFeed. Check out our new Jon Kabat Zinn online program Mindfulness In The Digital Age.